MOOG began in the USA in 1919 and was introduced to the European market in 2001 to much acclaim. 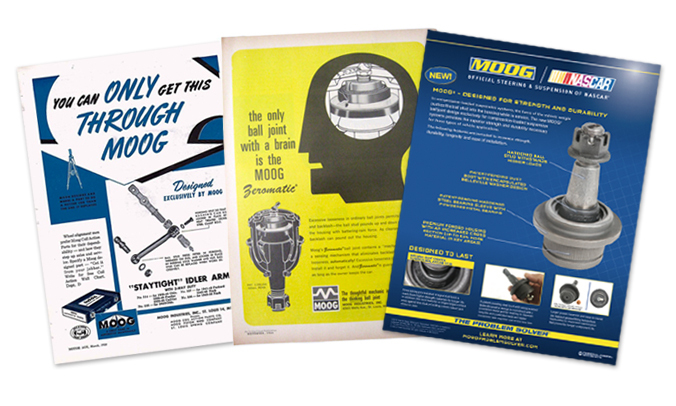 Today MOOG is a trusted brand of steering and suspension parts recognized internationally for high quality chassis parts. 2017 marks the launch of MOOG China bringing on a new high standard of quality, technologies and warranty in a new class of program for China. Thanks to our rigorous development and testing procedures, we are very confident about the quality of our products. That’s why every MOOG® Steering and Suspension part is backed-up by a market leading 3 year/100,000km warranty. It’s our guarantee for your peace of mind. MOOG is also number 1 in covering the vehicle parc in Europe and the United States and we look to do the same throughout Asia Pacific. MOOG launches in China and Asia Pacific bringing on a new high standard of quality, technoledgies and warranty in a new class of MOOG Chassis parts. Tony Stewart delivers a relentless performance in the final race to cap the greatest comeback in Chase history and win MOOG’s 46th Cup. The brand broadens its product offering with Asia-Spec™ and Euro-Spec components. MOOG celebrates its 50th year in business. The “Zeromatic” ball joint is introduced. It is a major step forward in design. A state-of-the-art wear simulator is installed in the MOOG test laboratories.